Training to reach your target pace takes time. Here are some tips to develop the right pace for race day. Pacing is key to your success on race day. Use these tips to calculate your perfect pace and make improvements to your training. 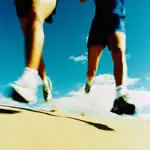 A target pace is an average running pace associated with an event time goal. If your event goal is to run a 3:45 marathon, your target pace is 8:35 per mile. If your goal is to run a 39:59 10K, your target pace is 6:26 per mile. Most marathoners run the second half of the race slower than the first. Learn how to keep a steady speed with these tips for proper pacing. If you regularly train on trails, you know that the uneven terrain makes it difficult to keep a steady pace. Get back on the roads once a week to sharpen your pace judgment. The most important thing a beginning runner can learn is a sense of pace. Controlling pace is the key to effective training and essential to winning. It takes discipline, confidence and experience to hold the paces that get you to the finish having run the best race that you are capable of. Running an even pace is definitely the way to go. But running negative splits often works even better. You can make this happen by going out slightly slower than race pace for the first, say, 20 to 50 percent of the race.